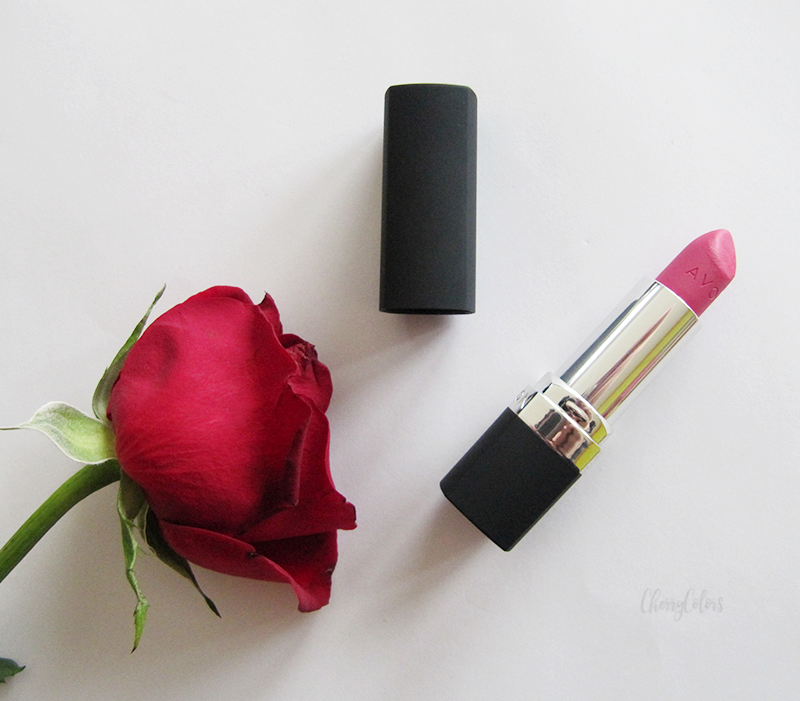 March & April 2016 Favorites - Cherry Colors - Cosmetics Heaven! 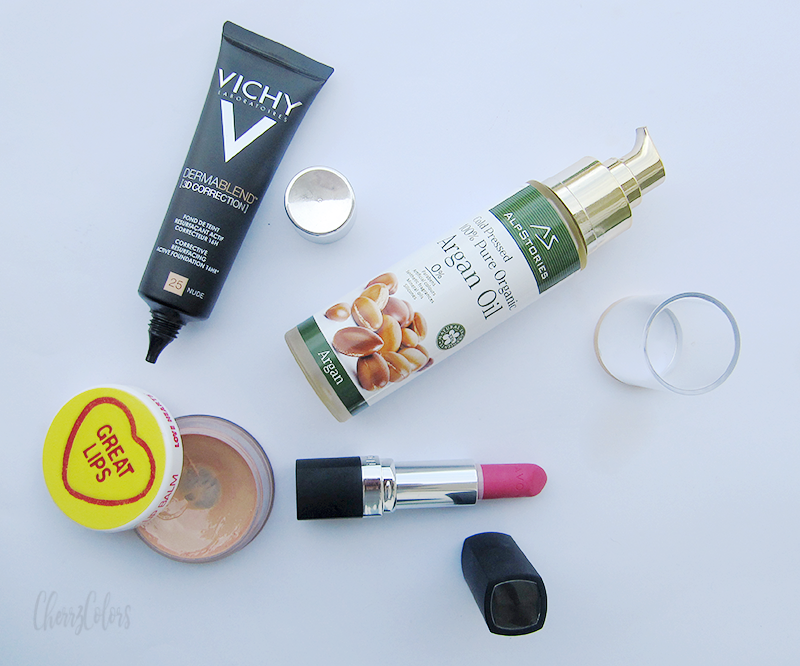 It's been quite a while since I talked about my favorite products, that's why I decided to share which ones I have been loving lately. 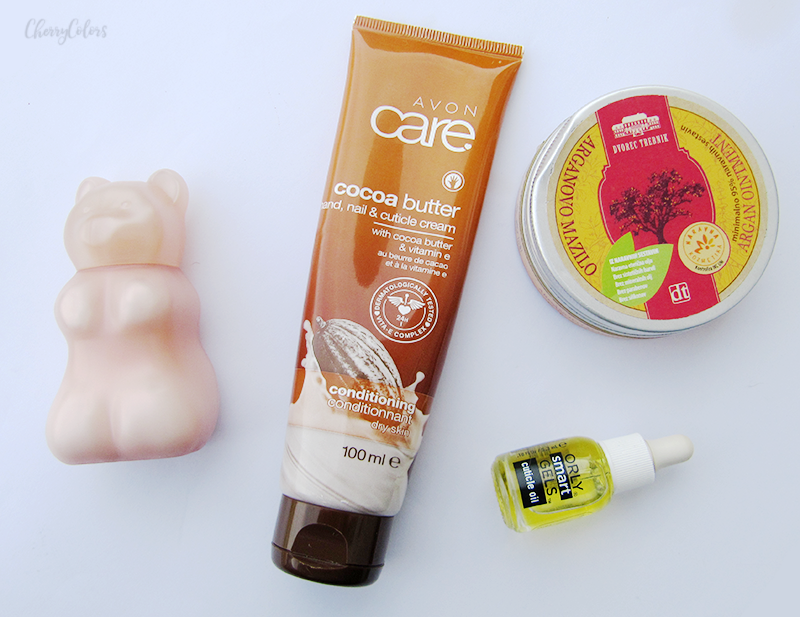 I divided this post into two categories: hand care and skincare/decorative cosmetics. Interested? Then read on :). I have been really happy with my hand & cuticle care routine. It makes my skin ultra soft and smelling nice! This is one of those things that I bought just because of the packaging design. I mean, it's super cute and if nothing else if would look great in photos, right? Well, it's not just cute, it's also a really good hand cream. The cream is on the thicker side, but it nourishes the skin and smells delicious. The cream does sink in quickly and leaves no film behind. The scent for me is more of a dark chocolate with dried raspberries in it. Yum! You can find it here. As above, I wasn't expecting much from this hand cream. I mean, before this one, I never tried an Avon hand cream. But now that I did, I know some things. The cream is this light fluid that sinks in fast and leaves the hands moisturized. The film is there for a couple of seconds but it isn't bothersome because it makes my hands feel super smooth. And then it just disappears and my skin is still happy and smooth :3. The scent is gentle, clean and warm. I wouldn't say it's chocolatey, but it's nice. I'm actually at the end of my tube, but luckily I've got another one, with a different scent. 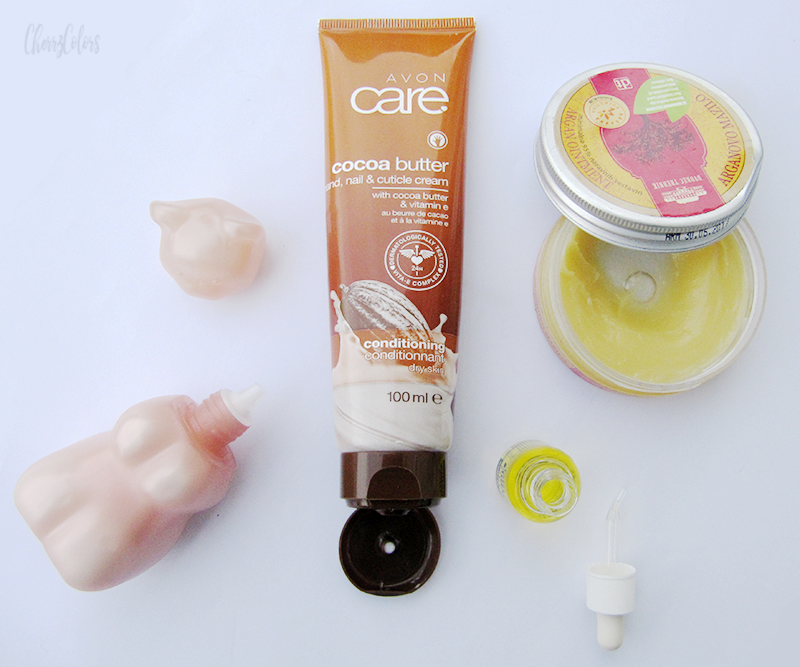 I'm very impressed with Avon hand creams! I got the oil when I purchased all the goodies from Orly (here) and I got an extra cuticle oil just because oils are awesome. If nothing else, I'd use it up and go on with my life. But this little thing is a cuticle savior! I mean, on the short run. The oil is thicker and smells delicious, maybe a bit peachy? I am not sure, I'm on my first coffee and on a "diet" of lack of sleep and can't really think that well. Eh! Anyway, the cuticle skin is absolutely wonderfully nourished after I use this oil on it. The effect lasts for a couple of hours, but with regular use, it does improve the state of the cuticle skin. It's great to use after a gel manicure. Cuticles do need some extra care because dry and weak cuticles look ugly and not only that. They are here to protect the matrix (nail root) from the harmful bacteria. If they are in bad shape there's a bigger chance you may get a nasty infection. Also, stop biting the cuticle skin!! Anyway, I'm rambling. This ointment is very thick (as the name suggests), heavy and smells nice. On the hands, it leaves a film which feels a bit heavy. But let me tell you, this baby shines where other products don't work. When your hands are feeling extra dry and rough and nothing just feels right, this is the product for you. Do you know how much I loved Lush lemony flutter? Well, this product is similar. Seriously. And has a less disgusting scent than that one. And also cheaper. It's a product I only got in the last month, but it's already on my favorites list. How's that? Truth to be told, even if this shade is too dark for me (I'm like Snowhite! ), the formula is great and the coverage is out of this world. My skin has been going through some terrible outbreaks (now it's getting better, yay!) and there was nothing that would just do the trick and cover it for more than 30 minutes. I tried so many things that I really got frustrated. Nothing worked. Except this foundation. It's on the thicker side but spreads easily. It also dries matte so there's no need for a setting powder. It, however, isn't meant for dry skin (they have a similar product for dry skin), because it will dry it out and accentuate all those flakes. You can get it at your local pharmacy. Oh, oh. Oils are awesome. My first skincare routine consisted of jojoba oil. 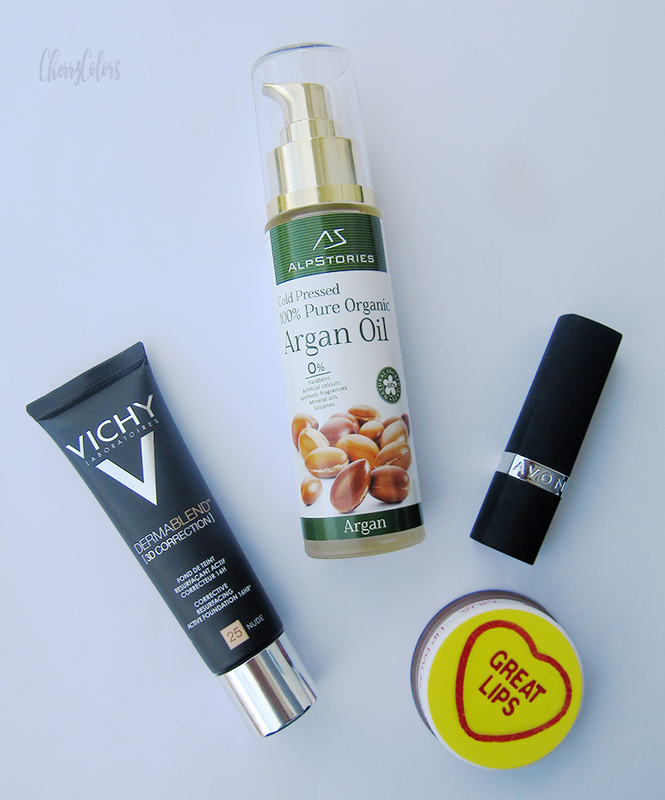 :D So I'm a bit familiar with oils, but I have never tried Argan oil before. Even if yes, in the last year they would just put argan oil in everything. It was like it's a damn miracle ingredient for all the dry skin and hair out there. But wait, is it? Haha. Okay, yes. It is. I had dry flakes of skin on my face and my creams didn't cut it, so I had to add some oils into my routine. I got it from the always amazing Alpstories and for now, I have only used it for my skin. It has a scent. A scent that brought me back into childhood because my grandma used it. Scent apart, the oil is lovely. While I had dry skin it worked well, but now that it's almost gone back to normal (combination skin) it would cause my pores to fill in and then I'd get small acne. Meh! But I can still use it on my hair because I heard it's just freaking amazing for that. And the face if you don't have combination or oily skin. You can get it here. Yes, it's another Avon product. I never though they had great stuff until I had the time and opportunity to try some products for myself. This lipstick is crazy. The pigmentation is awesome and it spreads on like a dream. Amazing! The lasting power is nice, but not too strong since it won't survive any fatty foods or drinks. But considering it's a matte lipstick it's not as drying as are other matte formulas. Not that I mind :). 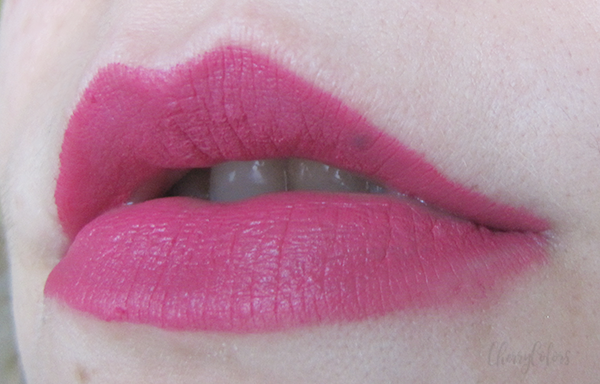 Also, the color is this a bit desaturated rose pink. Beautiful! You can find it here. I got this lip balm as a present back in December and I've been using it ever since. It feels nice on the lips, very smooth and non-sticky at all. The pot is a bit unhygienic but I don't really care since I use it only at home. And you get a lot of product (10g), considering you need a tiny bit for it to last you the whole day. I think it's a wonderful product. I couldn't find it in store, so I'm not sure where you can buy it. But I do know MUA has inexpensive products. Okay, so these were my current favorites. Is any of them your favorite too?